As we celebrate Independence Day and the signing of the Declaration of Independence in 1776 we should pay homage to the magnificent tree that was an importance cause of our conflict with Britain - eastern white pine, Pinus strobus. In 1605, a British ship captained by George Waymouth* sailed down the coast of Maine exploring for sites for future settlements. Waymouth was astonished to find enormous trees reaching to the sky. "Upon the hilles grow notable high timber trees, masts for ships of 400 tun..." Waymouth understood that these giant trees might be a solution for a problem that vexed the Royal Navy. Naval battles were won by the largest ships of the line that could be built. These ships required enormous masts, but Europe had run out of large trees. White pine was a perfect solution to the Navy's problem. The trees were as tall as 150 feet, 5 feet in diameter and could weigh 10 tons. The wood was strong, flexible and light weight. White pine made the best and largest masts in the world. 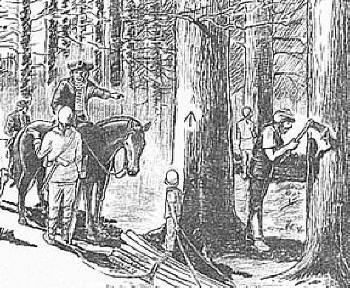 The first major industry in the Colonies was the export of white pine trees for the Royal Navy. Trees for masts had to be felled carefully, because the soft wood would shatter into splinters if the tree landed on a hard surface. Sawyers cleared a path to fell the tree, covering the ground with pine, spruce and fir branches to cushion the tree's fall. The trees were left until winter, when snow cover created a slick roadway. Large numbers of men and oxen were required to slowly move the tree to the nearest river or port, where they were loaded onto specialized mast ships. Even the shape of New England towns was influenced by the mast trade. 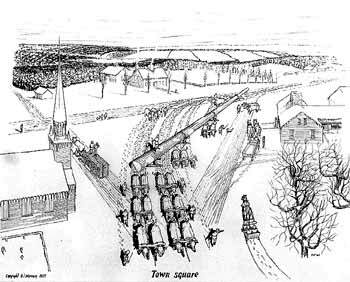 Instead of town squares, towns like Freeport Maine had (and often still have) triangular centers large enough to allow the turning of the giant masts. White pine was also needed to build the colonies. With its soft, easily sawn or hewn wood, white pine was a perfect construction wood. Conflict soon arose between the Royal Navy and the colonists for pines, especially the largest trees. The British administration declared all white pines larger than 2 feet diameter with straight clear stems to be the property of the King. 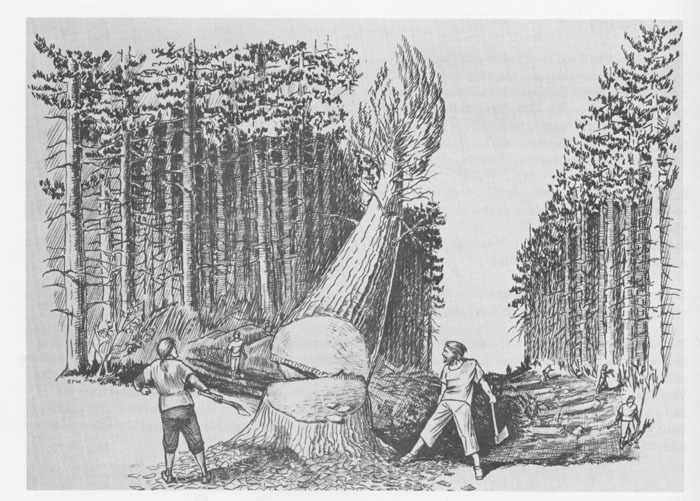 Colonists risked fines and jail for cutting the largest white pines. As long as the supply of pine was adequate, there was little conflict. As harvesting reduced the availability of pine, surveyors were sent to mark trees suitable for masts with the three axe strokes known as the King's Broad Arrow. Landowners then had to get permission to cut other pines, and even then they had to pay a hefty license fee. The colonists began to rebel. Mast trees were mysteriously burned or felled onto rocks, splintering them and making them useless for masts. Operators of many saw mills defied the King's decrees and processed pines, including some marked with the King's Broad Arrow. Sheriffs attempted to imprison the miscreants. Rather than succumb, a gang of men disguised with blackened faces attacked the King's men, beating them with switches and poles and destroying timber records. Eventually the men were arrested and tried, but the judge, sympathetic to the colonial cause, levied minimal fines and the men went free. This came to be known as the Pine Tree Riot, and preceded the Boston Tea Party by a couple of years. 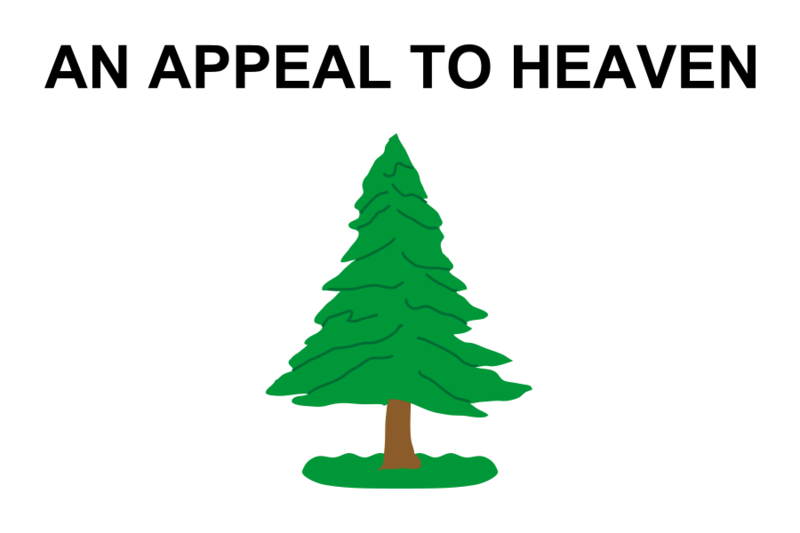 As insurgency spread throughout the colonies, the white pine became a symbol of freedom, appearing on flags and banners. One of the most prominent flags was emblazoned with a white pine and the words "An Appeal to Heaven." This flag, and others like it, appeared on colonial ships. Vermont placed a white pine on its colonial flag that is still on the state flag today. There were other causes of the rebellion, but there is little doubt that for the New England colonies, white pine was an important factor leading to the Declaration of Independence and American Revolution. As we celebrate Independence Day, we should remember the white pines that fueled the revolution. *In Europe, eastern white pine is called Weymouth pine after Lord Weymouth who imported the tree to England in 1696. Lord Weymouth is not related to George Waymouth. This is a source of confusion in some references. This story is based on a chapter in my forthcoming book The Lives of Trees. Engravings are from Manning, 1979, New England Masts and the King's Broad Arrow. HMS Victory, 1759, the oldest serving ship in the world. Masts are white pine. Posted in News and tagged American Revolution, Eastern white pine, Independence Day, Royal Navy, ships masts. ← Water your young trees!